Freshly Baked: Home Made Curd! I made curd of around 300 ml milk and used 1 tbsp of culture. 1. Bring milk to just a boil and then set aside to cool. One can use partially hot milk (boiled before)in summers and boiled milk in winters. Discard any "skin" that may have formed on the milk. Heating the milk to boiling kills any undesirable bacteria that might be present and also changes the properties of the milk protein so that it gives the yogurt a firmer body and texture. 2. Cool the milk by using two vessels to blend it. The higher you take milk to cool it the more air enters it and more nicely curd come out. Just cool enough or until luke warm to touch. - about 110 degrees F . Never put it hot or the milk will break off. 3. Spread the starter culture into the container that you are going to make the yogurt in. Blend it nicely so it goes to all corner of the container. Pour the warm milk into it with one hand and keep mixing the milk with another. Don't stop mixing till the milk is poured. Mix well but gently. Do not incorporate too much air. If too much air is mixed in, the starter culture will grow slowly. Cover with a couple of towels top and bottom to maintain an even temperature. I set curd in a small thick bowl (mud make) and covered it tightly(2 knots) with a thick cloth and then covered it with a woolen cloth nicely. I used a hot case with a thick hot thing holding cloth inside and then cover it with 2 containers. I kept it in portion below the gas. 4.Keep covered at room temperature for 3-4 hours(summers). 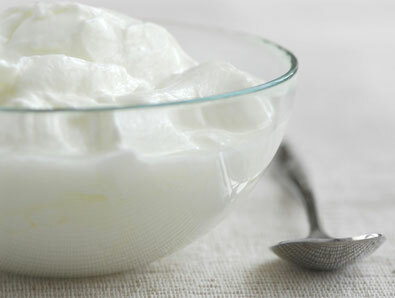 If we want a bit sweet yogurt one can mix half a teaspoon of sugar and set. Yogurt containers can be kept warm in a gas oven with pilot light and electric bulb, or an electric oven with light bulb of sufficient wattage - approximately 100 watts. Wide-mouth thermos bottles, heating pads, and sunny windows also have been used. Do not stir the yogurt during this period. It takes more hours in winter and I usualy set them at night and its done by morning. Around 6 hours. Refrigerate for 8 hours before serving. To store, keep in refrigerator. The yogurt will keep well, a week or two. 1.Boil the milk and allow it to cool well. Use preferably whole milk to get a thick consistency of the yogurt. 2.Pour the milk to another vessel because, it might have remnants that we don't want. 3.Add cultured buttermilk 2-3 tablespoons. 4.Cover it & Place it in the oven and set oven to 350 degrees for 2-3 minutes. 5.Now switch off the oven!! Let the milk be in the oven overnight. Next morning you will have a rich thick yogurt !. Remove it from the oven and place it in the fridge.